At BaselWorld 2014 Breguet introduced, among other models, the final version of the Classique Tourbillon extra-plat automatique (5377). International Watch sat down with Marc A. Hayek, President & CEO of Breguet, Blancpain and Jaquet Droz, to discuss how the ultra-thin platinum watch’s unusual peripheral rotor, silicon components and long, 90-hour power reserve were tested over the past year (in the atelier and on Mr. Hayek’s wrist) before it was released at this year’s show. Is it difficult to reconcile the classical profile, dials and cases of today’s Breguet with the high-tech caliber inside? Not at all, he says. Breguet himself would likely have done similar high-tech research to develop such a piece, he adds, as his namesake company does today. 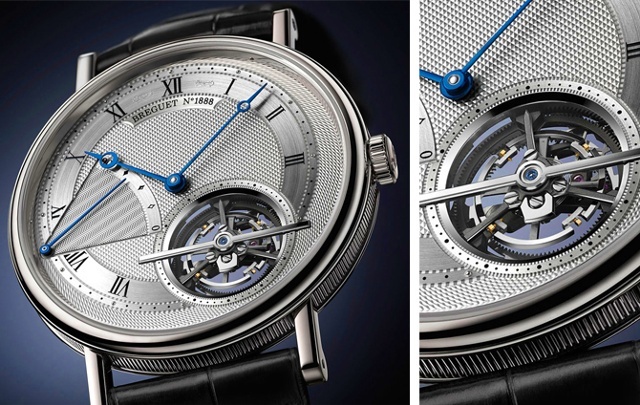 Breguet continues to combine such research with handcrafted dial and casemaking. The company still is in one of the few manufacturers that does all its engine-turned dial engravings by hand. In fact Breguet recently expanded its workshops at L’Orient to make room in its workshops for additional artisans. Watch our interview here for more of Marc Hayek at BaselWorld 2014.